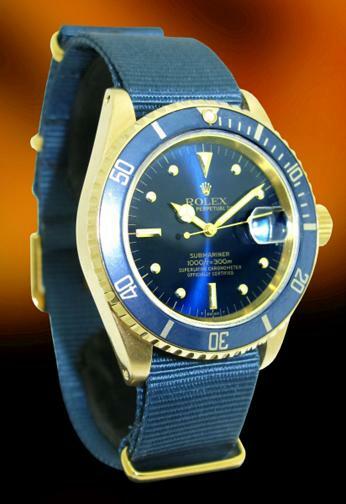 Rolex 16808 - Yellow gold Submariner with original blue-electric dial, and faded blue bezel insert, on a matching royal blue nato strap with gold buckles. A beautiful and unique piece! This rare Rolex Submariner in 18K yellow gold is a ref 16808, it has a 8 million serial number, and is a transitional model with sapphire crystal. The watch is just splendid and has been fully serviced!